Changing the exhaust note can be one of the most pleasing upgrades you can make. 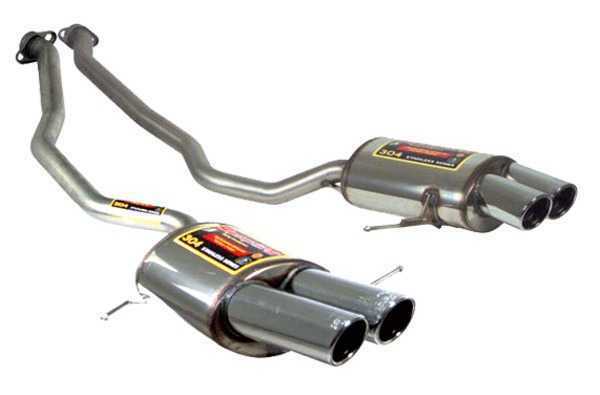 The stock mufflers do exactly what BMW intended them to - muffle and dampen the exhaust to meet 'luxury' levels. But if you want to hear more of that great BMW engine changing out the rear mufflers with this Supersprint sport exhaust will come through. Supersprint uses a free-flow design that makes the exhaust louder and sportier while also increasing power and torque. The sound is a muscular but refined rumble especially on the V8 models. There's a throaty burble at low RPM that fades away as the revs build. This gives the X5 a more muscular presence for around town driving but retains stock like sound for highway driving. This system comes with two 90mm round tips on each side.